Blogger, one of the top blogging platforms on the web, has recently been receiving some love from Google. Recent updates include an interface refresh, and new mobile views. Without a mobile app, however, blogging from small screens has has always been difficult. This month, to the delight of iPhone users all over the world, Google announced the launch of their Blogger App. The App promises to make adding photos and managing multiple blogs easier from mobile devices. 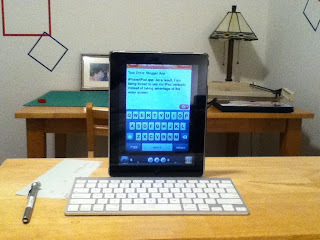 This post is currently being written on an iPad 2. Sadly, the App released by Google is an iPhone app, not a dual iPhone/iPad app. As a result, I am being forced to use my iPad vertically instead of taking advantage of the wider screen. The image above was taken on my iPhone and inserted into the post from my camera roll. Editing a post from multiple devices is easily accomplished from within the Blogger App. Geotagging is another feature included in the App. Common blogging essentials are still notably absent from the app such as the ability to insert links or media other than pictures, and rich-text editing. Thanks, Google, for pushing out a Blogger app. It is a considerable improvement, but there is a long way to go before the mobile interface is truly full-featured. Hi Lancey, I have not received that error. Have you assigned a post category (tag)? I don't believe that categories support special characters (<, > # etc). If you are using non text characters in your tag, I would remove them.